Read more about Closing Weekend Celebration! Bring the family up for a day of skiing and riding! The Easter Bunny has agreed to send hundreds of Easter Eggs to Eldora! Keep an eye out on the mountain for hidden eggs with fun prizes! For the little ones, we will have a special egg hunt in front of the Timbers/West Wing Lodges at 11am. This is a family-friendly event that will be fun for all ages! The Easter Bunny will also be showing off their skills on the hill so keep an eye out for that perfect photo opportunity! Starting March 2019, construction begins on a 15-mile stretch between Boulder and Nederland. The project is designed to remove the temporary repairs made after the flooding in 2013, with permanent, more long term repairs. Improvements will build in better storm resiliency and upgrade sections of the highway to improve motorist safety in the canyon. 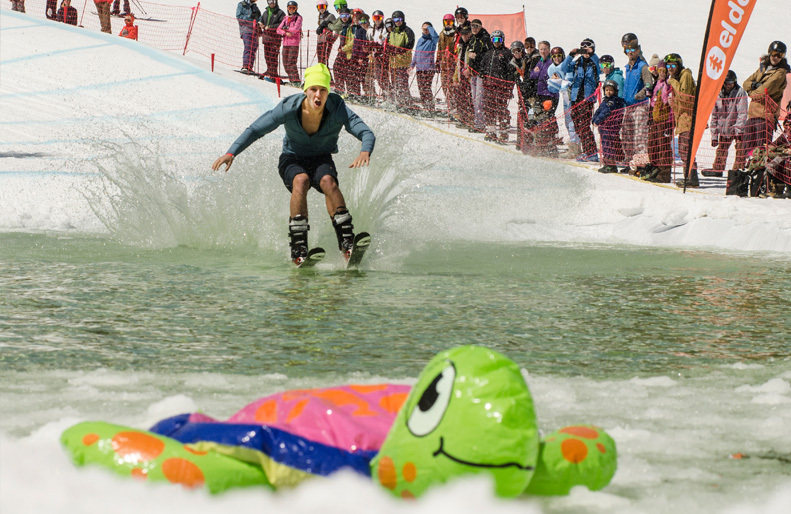 On Saturday, April 13th, hundreds of costumed competitors and cheering spectators turned out for Eldora's annual Pond Skim Party. The challenge: make it across the frigid, 90 foot man-made pond in one piece—without getting soaked. New for this season's event, the Warren Miller film crew was on hand, capturing footage for the Eldora segment in next winter's film. GRAB YOUR BEST HAWAIIAN SHIRT AND BEACH ATTIRE and c'mon up to celebrate the end of the best season in decades! Want to win a FREE set of Nokian tires? Assemble your craftiest crew and join us for your chance win our @nokiantyresusa scavenger hunt. We’ll be posting clues on our Instagram story starting at 9:00am on the day of the event. If you're the lucky person to find this elusive green tire, bring it to any Guest Services desk to claim your prize! Weather, venue, set-up, course-build, music, vibe—it all came together for the 3rd Annual Trick Ditch Banked Slalom, presented by 10 Barrel Brewing, right here at Eldora. Our Woodward parks crew spent the week prior pulling countless overtime hours to prepare a world-class venue comprised of a banked slalom course and, at the bottom, a quarterpipe/hip/big-air mashup feature. Want to win a FREE set of Nokian tires? Assemble your craftiest crew and join us for your chance win our @nokiantyresusa scavenger hunt. We’ll be posting clues on our Instagram story starting at 9:00am on Sunday, March 31st. If you're the lucky person to find this elusive green tire, bring it to any Guest Services desk to claim your prize!